Nestle Peters’ icecream, the Drumstick, is being promoted in “Summer Ritual”, an Australian television commercial released this summer. Summer Ritual provide a choreographed version of a phenomenon seen at swimming pool complexes around Australia each summer. Men and women arrive at a swimming pool in Broadmeadows, Melbourne. In synchronized actions the bathers lay down their towels, put on their sunblock. Women line up at the edge of the pool to test the water with their toes. The men jump in without hesitation. The women adjust their bikini bottoms. Swimmers clear the water from their ears as sun bathers shoo the flies away. Men, as one, ogle the ‘babe’ walking past. The response from their women is immediate – a discouraging slap. Finally the climax – the Drumstick ice cream from the ‘Esky’ – the ice cooler. One bather dares to remove the wrapping and start eating from the bottom of the waffle cone. He immediately attracts the shocked stares of his fellow bathers. However – it appears as though he’s started a trend… The tagline: “Drumstick – A Summer Classic”. The Drumstick Ritual advertisement was developed at Publicis Mojo, Melbourne, by creative director Darren Spiller, art director David Klein, copywriter Justin Ruben and agency producer Sally Davis. Filming was directed over two scorching days by Hamish Rothwell via Goodoil Films, with director of photography Nigel Bluck and producer Sam Long. Editing was done by Stewart Reeves at Guillotine, Sydney. Post production was done at Fin Design by Flame artist Richard Lambert. The final mix/sound design was done at Gusto Music by Colin Simkins. Casting key players and over 150 background extras was the responsibility of Mel Mackintosh at Mackintosh Casting. 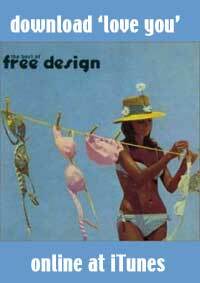 Karl Richter at Level 2 Music, found the music for Drumstick Summer Ritual, “Love You”, a track from 1960s American band The Free Design. The Free Design, consisting of members of the Dedrick Family in New York, released seven albums from 1967 to 1972. The track, “Love You” played during the closing credits of the 2006 movie, “Stranger Than Fiction”. “Love You” first appeared on the album, “Free Design Sings for Very Important People”. Take off your shoes and socks and run you. Stop and listen love you. Joey catch a kangaroo hug you.